Peppa Pig. One of the most popular characters on kids TV to ever grace our screens. Jack absolutely adored her when he was younger and now his sister Olivia is at the perfect age for Peppa herself. Peppa is one of the words in her small vocabulary and she loves nothing more than sitting down and watching an episode either by herself or with her brother. She spots the magazines in the newsagents and the toys in the toy shops and always wants Peppa! We were recently sent the Laugh and Learn laptop. The laptop is a fun and interactive toy that Olivia has really enjoyed playing with. 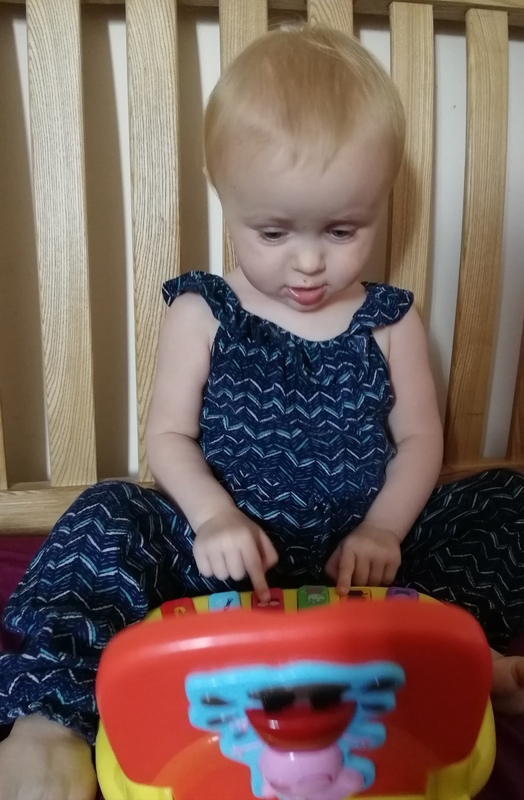 It has a portable carry handle so it is easy for her to transport from place to place and has four different modes that they can play to help them learn new things such as colours, numbers and letters. I have been keen to get her an interactive toy like this as Jack really blossomed when he played with similar toys and I’d like the same to be said for Olivia too. You can press the buttons at the bottom and be told what is on each button (the Discover mode). You can also find out which number/letter buttons match the pictures on the screen. Something I’ve really loved about this is that when Peppa is telling you about something, that particular image will light up on the screen. There is also the opportunity to answer questions (the Quiz mode) – Jack has helped Olivia with these as she doesn’t quite ‘get’ this yet. They can also find certain pictures and colours (What Can You Find? mode) or they can even hear different musical instruments (Music mode) There really is so much that this laptop can do. 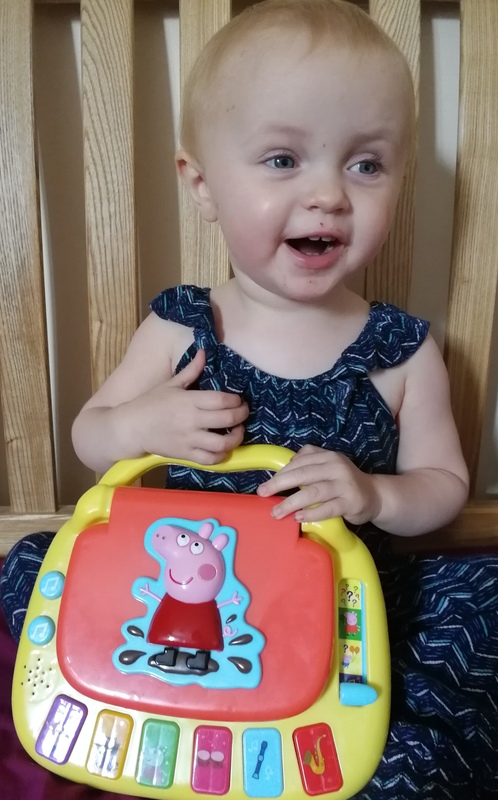 The pictures are bright and colourful and easy to see – very eye catching indeed , the buttons are big enough for clumsy toddler hands and the screen is large enough for them to be able to see what is lighting up as Peppa speaks to them. 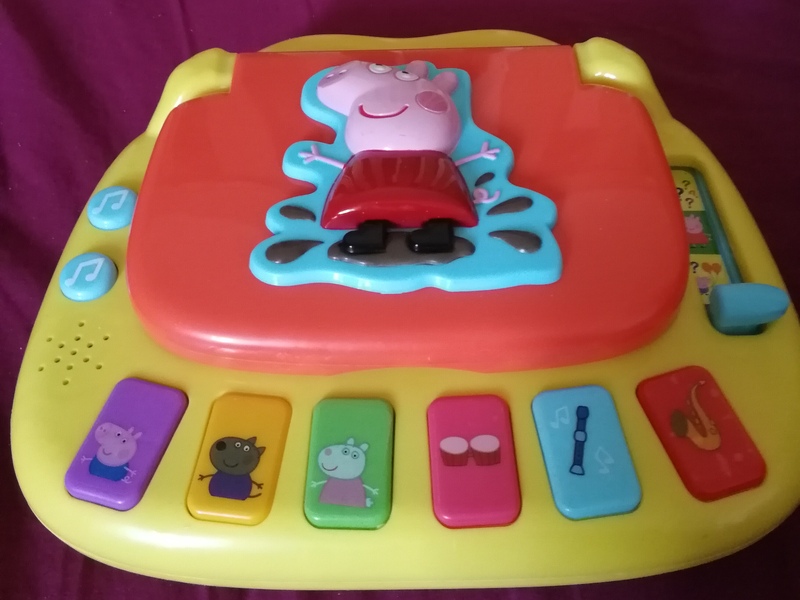 Peppa’s voice and the music the laptop plays is very loud so be aware – but your kids will absolutely love this! Peppa’s voice is instantly recognisable too as is the theme tune that plays as you turn it on. Olivia has been interacting really well with it. A lot of the time, she presses buttons at random as she is still a little young to understand in some senses BUT I have already noticed her adding new words into her vocabulary – for ages, she’s only been able to say the number two but she recently added one, three and four since the laptop arrived! Her hand eye coordination has also come on leaps and bounds – she can be a little clumsy sometimes but I’ve noticed that she’s often managing to do what she is trying to. The laptop is a decent size, chunky too and very durable which is great when young hands are playing with it as we all know that they are very adept at pushing things away or trying to throw them. As you can imagine, I’m a blogger and freelance writer so I always have my laptop out and Olivia has comically come and sat next to me on the sofa a couple of times whilst I am tapping away and started tapping away at her own – she really feels like she is doing her own work and can be just like Mummy! 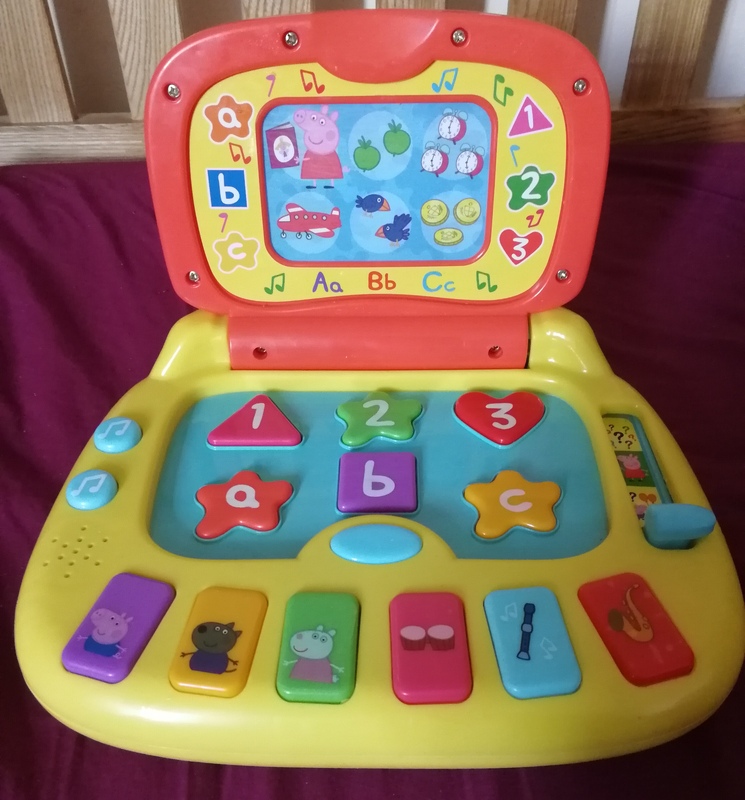 Retailing at £19.99, the laptop is recommended for ages 2 and above – although Olivia is just under 2 and really enjoying it and learning from it. It requires 3xAA batteries which are included. 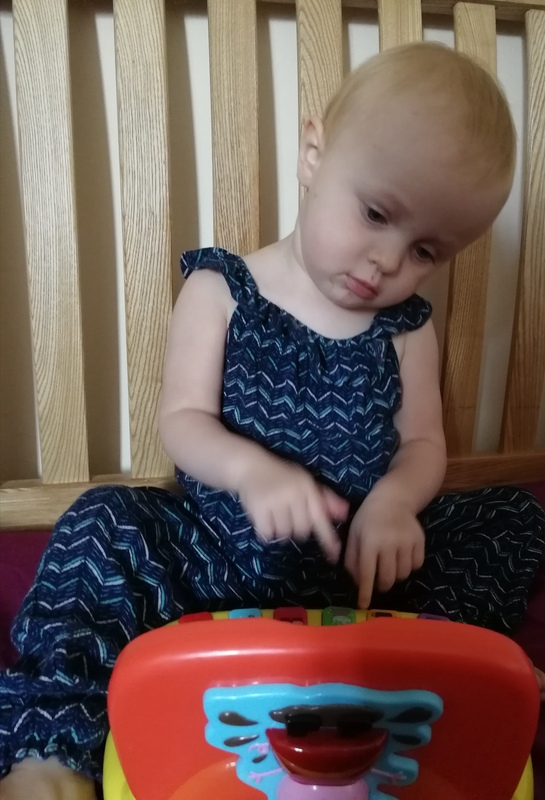 I would definitely recommend this to anyone who is looking to aid their toddler’s learning – Olivia has really been enjoying playing with it and learning new things and it has been great seeing her enjoy herself and discover new things. If you’d like the chance to win one yourself, then please fill in the Rafflecopter below. This giveaway is UK only and ends at 23.59pm on the 28th of September 2018. Good luck! All terms and conditions can be found on the Rafflecopter. My little niece who loves Peppa Pig. Fab post, my cousins daughter would love this. Thanks for sharing . My Granddaughter Margot. A big fan of Peppa Pig! My god-daughter Florence would make the most of this little beauty. This looks like a fab idea for my daughter’s Christmas present. My grandson who loves Peppa Pig. I would like to win it for my nephew! My granddaughter she would love this. I would love so much to win this for my 2 year old. She has speech delay and is waiting for an assessment from speech therapy. She is also crazy about Peppa Pig! I’d love to win for a Santa present. The kids or godkids, would have to toss a coin! My 2 year old son loves Peppa Pig, I also have a little girl due 2nd December! I would love to win this for my Godson for Christmas. I would really love to win this for my nephew! I’d love to win this for LEo who has been mad about Peppa Pig ever since he visited PP world in August! I’d love this for my daughter. My little cousin – she loves Peppa! I would love to win this for my nephew Neo. He is peppa pig crazy. I would love to win this for my daughter Sophie. I’d love to win this prize for my niece. I would like to win this for my nephew who loves Peppa Pig. For my littlest son. He is three and loves Peppa Pig! My twin 3 year old daughters. 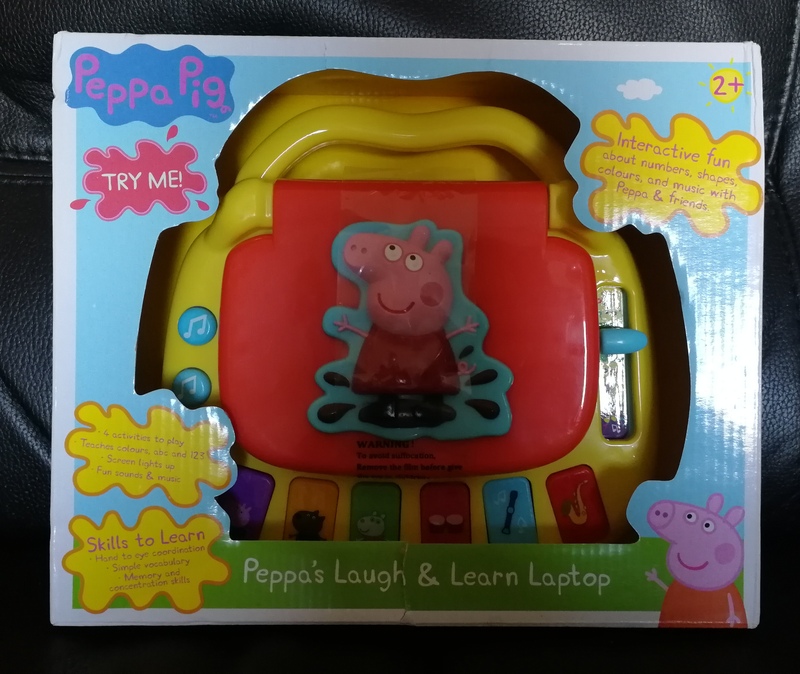 I would love to win this fabulous Peppa Pig laptop for my little princess, Zivah. My great-niece Mylah would love this. Thanks for the chance. Would love this for my little boy, he loves peppa pig! This would make a lovely Christmas present for my niece. Would love to win for my great niece – sounds like great fun! I would love to win this for my niece, she’d love it! I would love to win this amazing prize for my little girl. I love reading your blogs. Keep up the Amazing work.